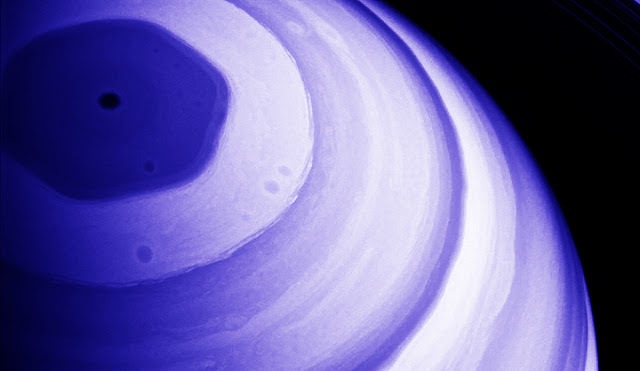 A strange hexagonal vortex formed above the north pole on Saturn, shows Cassini-Huygens data. The vortex has formed hundreds of miles of clouds in the planet's stratosphere, the researchers say in the study. Previously, specialists could see the formation of a hexagon, but at a much lower altitude. According to Live Science, the way these hexagons are formed at different altitudes is still a mystery for researchers. NASA's Cassini probe arrived in Saturn's 2004 system, when it was summer in the southern hemisphere and winter in the northern one. At that point, the probe documented the high altitude circular vortex produced only at the southern pole of the planet. Prior to Cassini's observations, the Voyager probe presented in 1980 the existence of low-altitude hexagons in the North Pole region of the planet. Hexagon is considered a long-lasting current associated with Saturn's rotation, similar to how Earth's rotation influences polar currents. At the time of the discovery, Cassini could not use the tools to capture the phenomenon in pictures because of the extremely low temperatures at the North Pole of -158 degrees Celsius. So Cassini had to wait for the summer to make the observations. "One year on Saturn is the equivalent of 30 Earth years, so the winters are long. The planet has only begun to leave winter in 2009, "said Sandrine Guerlet, co-author of the study in the Dynamic Meteorology Library, France. During his mission, Cassini managed to record images with both inferior and higher hexagons on Saturn. The disparity between the phenomena of Saturn's poles has made specialists believe that the poles of the planet are subject to different processes, which are asymmetric. The recently observed vortex on Saturn did not form a single hexagonal column because the currents on Saturn are changing drastically depending on altitude.